Los Angeles, CA (November 4, 2014) - Rising star composer Sarah Schachner (Assassin's Creed IV Black Flag, Far Cry 3, Lazarus) returns to Ubisoft's flagship series Assassin's Creed to score the combat, co-op and multiplayer music for this year's most anticipated next-gen blockbuster title, Assassin's Creed® Unity, a new epic adventure set within Paris during the French Revolution. The soundtrack is now available digitally through Ubisoft Music and will also be released on limited edition vinyl. 4 full-length tracks are available to preview on Soundcloud. Schachner combines her dynamic talents as an accomplished multi-instrumentalist (violin, cello, guitar, mandolin, voice) and modular synth artist/programmer to create a unique classical soundscape infused with analog pulses. "The French revolution was an interesting time musically because it was at the beginning of the classical period but there was still some crossover from the baroque era," explains Schachner. "The missions at Versailles, for instance, reflect more of the overly flourished baroque sound that the aristocracy was reluctant to let go of." 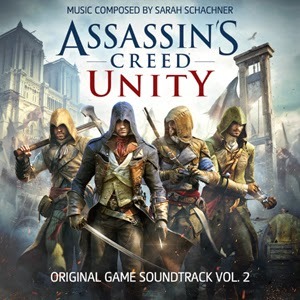 Sarah Schachner's action-driven score for Assassin's Creed® Unity immerses players in the time period during which the action takes place but also reflects the game's overarching modern sci-fi element. "The combat music in Unity needed to strike a balance between the methodical and calculated chamber sound of the era while also encompassing the passion and struggle that was at the center of the revolution," continues Schachner. "As always with the franchise, the player is periodically reminded of the sci-fi modern Abstergo element with low gritty analog synth pulses weaving in and out of the classical soundscape." Sarah's previous scoring credits include arranging and composing additional music for Brian Tyler on various cinematic projects such as Call of Duty: Modern Warfare 3, Far Cry 3, Now You See Me, Iron Man 3 and Assassin's Creed IV Black Flag, which was nominated for a 2014 BAFTA Award for Best Original Music. Her upcoming projects include the Lionsgate horror thriller Lazarus produced by Jason Blum (Paranormal Activity, Insidious, Purge) and starring Olivia Wilde, Mark Duplass, Donald Glover, Evan Peters and Sarah Bolger. Lazarus premieres in US theaters January 2015. Set in a once-magnificent Paris, Assassin's Creed Unity plunges into the terror of the 1789 French Revolution and features the most dense and immersive Assassin's Creed city ever created. Through the streets of Paris, the starving inhabitants are set to take up arms for freedom and equality. In this time of chaos and brutality, a young man named Arno, wounded by the loss of those he loved, sets on a deadly path of redemption. Arno's pursuit throws him into the middle of a ruthless struggle for the fate of a nation, and transforms him into a true Master Assassin. Assassin's Creed® Unity will be released on November 11 in the US and on November 13 in Europe. For more information visit www.assassinscreed.com. I've never been much a fan of video games, but this sounds fun.